Usually a weak, painful back can be correlated with tight hamstrings (located behind your upper legs). This exercise with help relax your hamstrings BEFORE starting back strength exercises. 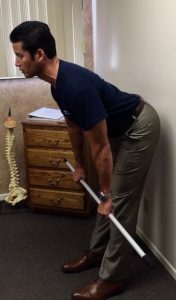 Recovering from poor posture and/or back pain requires a game plan. If you have pain during this stretch, before you start exercising please get checked by your local chiropractor to avoid causing an injury during any exercise. Here are the specific steps for each position. Position 1: On the wall. Move your feet 3 inches off the wall, keep your your hips, shoulders, head against the wall and hold a broomstick in front of you. To set the curve in your back, place your fist behind your lower back. Lower the broomstick down your legs only to where your lower back does not move. Stop. Then slower return to the starting position, maintaining your lower back position. If this feels comfortable, then go to position 2. Position 2: Off the wall. Stand up straight, moving your weight to your heels. 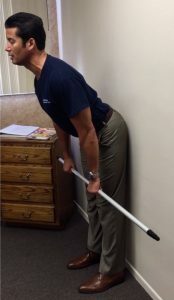 Slide the broomstick down your legs, keeping your lower back from moving (important). Stop where your hamstrings tighten, then return to the starting position without moving your lower back. 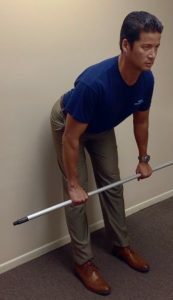 Continue this hamstring stretch until they feel relaxed as you move the broomstick down your legs. 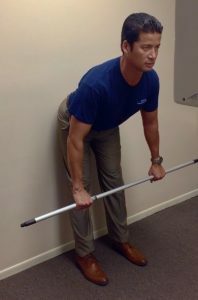 Then you are ready to start these standing low back strength exercises (in the related articles below) for a strong back.